We estimate the market for operations support systems (OSS) and business support systems (BSS) grew around 1 percent in 2017 to $17.8 billion. This represents a recovery from an estimated 5 percent decline in 2016. We forecast market growth of around 2 percent in 2018 as some small and midsized companies continue to grow, while the larger players see their revenues stabilize. Beyond 2018, growth in the market is likely to depend on communications service provider (CSP) appetite to invest in digital transformation; new entrants, such as mobile virtual network operators (MVNOs), looking to launch telecom services on third-party infrastructure; and the financial health of the traditional service provider industry. The market remains dominated by five vendors – Amdocs, Huawei, Ericsson, Netcracker and Oracle – collectively taking around 60 percent share, followed by a long tail of smaller vendors. Some midsized companies have suffered from low or negative margins. This has prompted a change in management and significant downsizing at Optiva (previously known as Redknee) and private equity interest in Helsinki-listed Tecnotree. OSS/BSS Vendor Landscape: Industry Outlook & Company Analysis, 2018 analyzes who does what in the OSS/BSS market, how big the market is, and how revenue is divided among the key vendors. The report also examines how the market fared in 2017, how profit margins have evolved over 2015-2017, how M&A activity has evolved over the last year, and what the prognosis is for 2018 and beyond. In last year's version of this report, we profiled larger OSS/BSS vendors, including Amdocs, AsiaInfo, Cerillion, Comarch, Comptel, CSG International, Ericsson, HPE, IBM, InfoVista, MYCOM OSI, Netcracker, Nokia, Openet Telecom, Oracle, Redknee (now Optiva), Spirent, Subex and TEOCO. This year, we have profiled 31 smaller vendors that have come onto our radar in the last year. The OSS/BSS market is likely to undergo significant change in the coming years, driven by the move to network virtualization and, more broadly, by the transformation of communications service providers into digital service providers. Whether these forces lead to a consolidation around a handful of full-suite providers or a proliferation of best-of-breed vendors remains to be seen. However, modernization of OSS/BSS will be key to the automation of network and customer operations, as well as the increase in openness and agility that CSPs need in order to compete as we approach the 2020s. Given that CSPs do not disclose their expenditure on OSS/BSS, it is difficult to do a top-down analysis of the market. We have undertaken a bottom-up analysis of the size of the OSS/BSS market based on revenue disclosures and estimates of 117 vendors (our previous study looked at the top 50). Based on our estimates, we derive a total value for the OSS/BSS market of around $17.8 billion, up 1 percent from $17.7 billion in 2016. 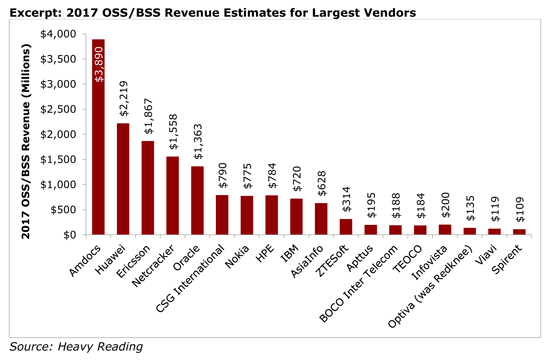 The excerpt below shows our 2017 estimates for all vendors with more than $100 million in annual OSS/BSS revenue, which includes 18 of the total universe of 100 vendors that we considered. The top five vendors have a collective 61 percent share of our total market estimate. The other 13 vendors with revenue of more than $100 million comprise another 29 percent. The remaining 82 vendors make up the last 10 percent share. OSS/BSS Vendor Landscape: Industry Outlook & Company Analysis, 2018 is published in PDF format.